by Bradin Cormack, Martha C. Nussbaum, and Richard Strier (eds.). Chicago: The University of Chicago Press, 2013. 335pp. Cloth $35.00. ISBN: 9780226924939. Reviewed by William Haltom, Department of Politics and Government, University of Puget Sound. Email: haltom [at] pugetsound.edu. Regular readers of “The Law and Politics Book Review” will likely find SHAKESPEARE AND THE LAW a book worth ordering for and through a school’s library. More than a few specialists in “law and literature” may want to own a copy that they may savor at their leisure and peruse for their avocation the learning with which the volume teems. Other scholars may select one or a few chapters for intense reading but skim or skip other chapters. Perhaps this or that instructor will dare assign SHAKESPEARE AND THE LAW to graduate seminarians, but most undergraduates and many graduates in many disciplines will find the collection of essays daunting. SHAKESPEARE AND THE LAW has multiple connections to seminars and collaborations at the University of Chicago but lives up to its subtitle ‒ A CONVERSATION AMONG DISCIPLINES AND PROFESSIONS ‒ figuratively if not literally. The University of Chicago Press published this volume based in a 2009 conference, “SHAKESPEARE AND THE LAW,” at the University of Chicago. A majority of the chapters draw on papers for that conference, and the roundtable excerpted on pp. 301-322 was a major event at that conference. The three organizers of that conference have affiliations with the University of Chicago and have taught together seminars on law and Shakespeare. Two of them edited the volume with an additional faculty member from that university. Of sixteen contributors listed on pp. 323-326, nine have some evident connection to Chicago (and four with the law school) but seven do not. The book contains more than one conversation among contributors from various disciplines and professions, including Justice Stephen Breyer of the United States Supreme Court and Judge Diane Wood of the Seventh Circuit Court of Appeals (based in Chicago). The introduction “situates” the volume within a subfield of Shakespeare studies (p.4) then identifies three species of “law and literature” that are represented: “legally informed lovers of literature;” writers who tend to deploy literary sources to challenge economic approaches to the law; and students of literature who connect literature to legal contexts or the production of laws and lawfulness, or both. The editors admit that more radical approaches or applications are not represented in the volume, so neither postmodern nor “critical” interpretations of Shakespeare and law should be expected (pp. 5-6). For many students and teachers of sociolegal studies, then, this collection by the admission of its editors is at least peripheral. The editors present the collection in five [*456] parts. Part One (pp. 21-97) concerns “How to Think ‘Law and Literature’ in Shakespeare.” Three essays discuss ways of thinking about and perceiving law and literature and their interrelations. A philosopher [focusing on “Macbeth”] and two students of literature [considering “The Winter’s Tale” and “Othello”] supply insights perhaps likelier to interest humanists than legal scholars or practitioners, but their essays include sophisticated considerations of methodology. 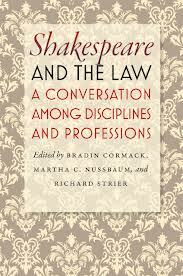 Part Two (pp.101-143) features two assessments how much The Bard knew about law. These are probably of interest to readers of “The Law and Politics Book Review” as well as those who know “Measure for Measure” or “Othello” well. True to the volume’s subtitle, one is a law professor and the other a literary scholar. Part Three (pp. 147-200) has four essays, two written by prominent, prolific legal writers, Richard Posner and Charles Fried, about “The Merchant of Venice” and two others by literary scholars who dissect “Measure for Measure” and “Henry IV, Part 2” [and, slightly, “The Merchant of Venice”]. Part Four (pp. 203-299) ranges widely, following law into the contexts of Shakespeare’s plays and our world. Five essays in that part plumb, in order, “King Lear,” “The Merchant of Venice,” “Cymbeline,” “Julius Caesar,” and “Two Gentlemen of Verona” and other comedies. The array of plays to which essays make extensive reference, it follows, is extensive but not exhaustive. As noted above, Part V conveys parts of a conversation among “A Justice, a Judge, A Philosopher, and an English Professor.” Philosopher Martha Nussbaum moderates and participates in a symposium with Justice Stephen Breyer and Judge Richard Posner, and remarks from Robert Henry, a former U. S. judge turned university president and professor of humanities who did not participate in the roundtable at the conference are interpolated. The conversation entertains and informs, but devotees of law and politics may not be all that interested whether Hamlet’s father was a ghost or a demon, in what Protestants at Shakespeare’s plays would have made of Purgatory, in Shakespeare’s dedication to reading and to current events, in whether the Sermon on the Mount pathetically overstated humans’ duties, or in with which characters the persons on the roundtable may most identify. Even the sheer wit and erudition of the participants did not save Part Five from being a partial script for “My Multiple Dinners with Multiple Andres,” but readers other than the reviewer likely would have more interest in this or that sally. That is why this volume may satisfy this or that sociolegal reader but likely will not be very useful to rank and file students and teachers. That participants in Part V performed scenes from “Hamlet,” “Measure for Measure,” and “As You Like It” of course shapes the roundtable that followed. Justice Breyer selected these three scenes because he liked the plays (p.301), so the scenes need to be all that pertinent to legal matters of great or broad import. Still, Nussbaum on emotion and disgust [“ … I think that Measure for Measure and Hamlet, which were probably written pretty close to each other in Shakespeare’s career, have a similar focus on sexuality as fearful and disgusting, and as a danger to good order and political authority” (p.310)], [*457] and Posner’s brief summary of the accomplishments and emphases of the law-and-literature movement may inform or interest some readers. The book does direct readers to www.law.uchicago.edu, a search of which will turn up audio files of the keynote discussion and of the three scenes enacted by the keynote discussants. This collection, in sum, pertains most to the plays listed in this review but pertains far less to specific emphases in law-oriented courses. Copyright 2013 by William Haltom.